If you use Chrome on multiple computers (Windows/Mac OS X/Linux), you can login with your Google account to keep bookmarks and settings synchronized. 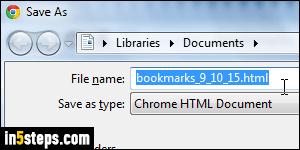 To import them into other web browsers (Firefox, Safari, Internet Explorer, Opera...), you can also export your Chrome bookmarks to an HTML file. Chrome even lets you selectively export a specific bookmark folder. 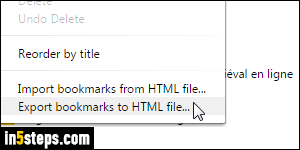 By the way, exporting your bookmarks is a quick and easy way of backing them up! Once in Chrome, click on the menu button (top right), and go to Bookmarks > Bookmark manager. You can also launch it by with the Ctrl+Shift+O keyboard shortcut (Windows / Linux), or Cmd+Option+B on Mac OS X. Either way, this opens a new tab to the chrome://bookmarks/ internal URL (address). If you see a pound sign and number at the end (like chrome://bookmarks/#1), it just means that Chrome has automatically selected the first bookmark folder. 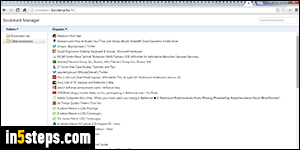 In the Manager, select the bookmark folder you want to export: you should have an "Other bookmarks" containing links to sites added as favorites by clicking on the star in the address bar (omnibox, as Google calls it), or by hitting Ctrl+D / Cmd+D. There should also be a Bookmarks bar folder, which stores sites dragged to that toolbar: it's hidden by default, but you can show it with Ctrl+Shift+B / Cmd+Shift+B. Finally, any bookmark folders you created. 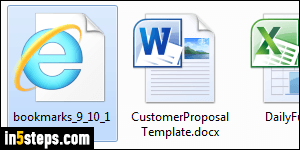 Select a folder, click on the Organize dropdown button at the top, and choose "Export bookmarks to HTML file". Chrome will name your file after today's date, like "bookmarks_m_d_yy.html", and selects your Documents folder. You can type a new name, and save it wherever you like. (Keep the ".html" at the end if you've set Windows to show file extensions.) Click Save to export. The fact that Chrome exports to an HTML file means that you can view that file in any browser, as if it were a web page (it is one, in fact - just a very simple one :) If you're doing research for a project, you can bookmark all relevant websites in a dedicated bookmark folder, export it as shown above, and share it (copy-paste its content in an email, upload with FTP it to a server, share it with Dropbox, etc.) HTML is a universal format, so the possibilities are endless!